This was good, but not great. With it being a casserole, I expected more eggs. I did changed it up a bit and used Old Bay Seasoning instead of the onion and parsley combo. To be honest, I think it was a little overwhelming with the seasoned croutons and the Old Bay Seasoning....it over powered the taste of the crab. 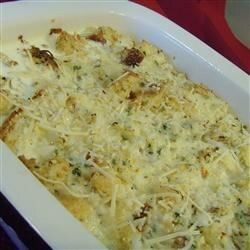 I will probably make this again with Old Bay, but will try it w/unseasoned croutons. Guess it's all a matter of taste....my husband loved it.